Sana kolay gelsin: may it be easy! 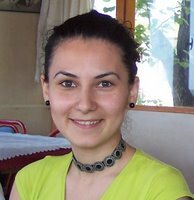 More than a year after the trip to Turkey, I'm still using instant messenger to keep in touch with friends like Celile Bozkir, the Bakir family, Necati Demircan, Bulent Tuzun, the Karaselcuk family, Ata Onucak, Merve Gokben, and more. I'm also still listening to music by artists like Sezen Aksu, Burcu Gunes, Tarkan, Athena, Yalin, and Kenan Dogulu. Not understanding most of the lyrics means I absorb the music's varied and enchanting melody and tone. But slowly, I'm learning what the lyrics are about. Our translator from the weekend in Sakarya, the delightful Celile, has been explaining the lyrics' meaning. This has, of course, helped my understanding of the Turkish language. There are few better people to ask than Celile, a university English teacher in Istanbul. "What does the word 'ask' mean?" I asked. "It appears in several song titles by Athena." "'Ask' means LOVE!" she replied. Without a doubt, I was feeling pretty confident about my vocabulary when young Mr. Kaan Karaselcuk said merhaba one day. 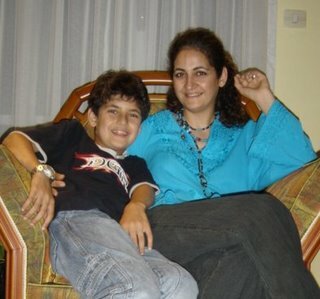 During our team's stay in Mersin last year, Kaan's mother Nilufer had been encouraging him to work on his English skills. But on this day, I had no phrasebook with me, and this fact led to a discussion about sports, geography, and food. We talked about the Galatasaray, Fenerbahce, and Besiktas football teams, the Akdeniz (Mediterranean Sea), and delicious kebabs, sucuk, and kahve. And when it came time to go, I remembered a word Celile had taught me: 'calismak' (work). My Turkish phrasebook is now a permanent fixture next to my desk. Talking to my friends in Turkey definitely helps ease the day. As Celile explained, "sana kolay gelsin" (may it be easy). Can it really be? Jan pointed out in an email to our team last weekend that it's been six months since our trip. Six months ago today, I was eating pistachio-covered ice cream with Firuz and Duthan Harbiyeli (left) in Antakya after the Rotary Kulubu meeting, and after receiving valuable tennis tutoring from Firuz! 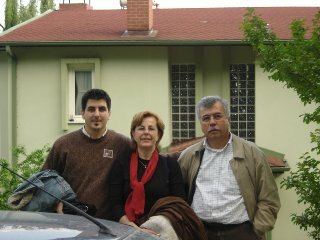 The Harbiyelis' son, Ibrahim Inan, is one of the Turks with whom I've corresponded since the trip. Inan was away at Mersin University during our trip, but Firuz and Duthan showed him the blog, and he emailed me to say "hello from Antioch". 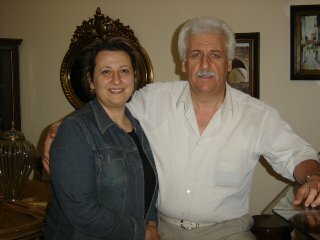 Ilhan Karaselcuk and I have chatted a few times on instant messenger. His web cam showed Mersin's summertime sunset visible through the Karaselcuklar office window. Ilhan said that his wife Nilufer had visited her sister in Tunisia, and that a few weeks later, Nilufer's sister visited Mersin. The Karaselcuks are at right. 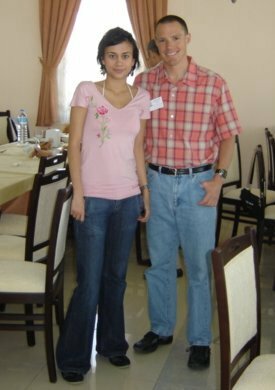 Thanks to instant messenger, Merve Gokben and I have also kept in touch. 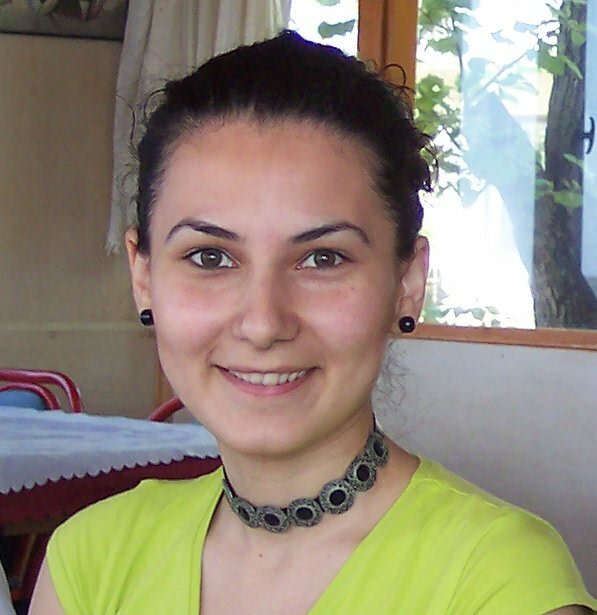 She's a student in International Relations at Ankara's Middle East Technical University. Merve joined us for Sunday brunch in Konya. Today she told me about her midterm paper for METU. The midterm topic was idealism and liberalism, and Merve wrote a play about post-Cold War politics called "God is confused". Baffled by events following the Cold War, God starts to question political actors. In the end, he decides not to interfere with worldly issues, and lets mortals determine their own fates. God instead opts to think about heavenly issues, which as Merve (at left) explained, are more entertaining. What a great concept for a paper! Today I also learned that Konya is also the home to the inventor of Orkut.com, a social networking community from Google. The website's founder, Orkut Buyukkokten, is from Konya and is also a graduate of Bilkent University in Ankara (which we visited on our last day in Ankara). Since our return to Denver, my teammates and I have remained close, meeting up once a month or so. 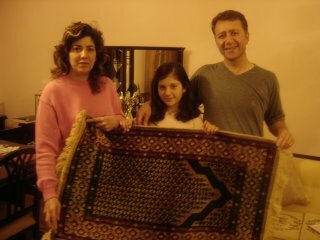 In July, I hosted a Turkish themed party, and a month later we gathered for Bethany's birthday (mutlu yillar Betty!). 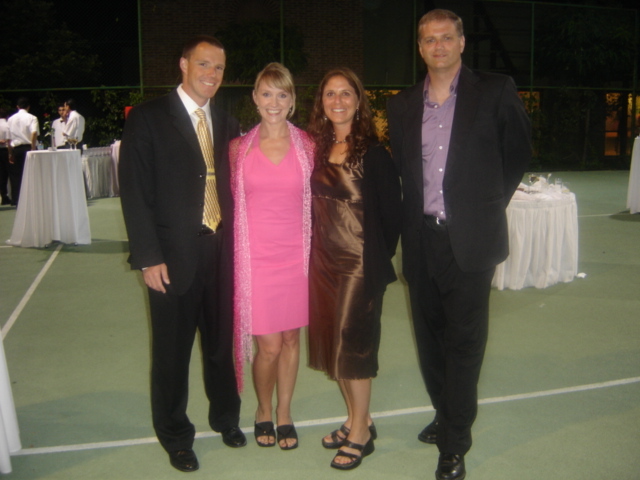 Steve and Juliet hosted a party in September, and in October Lisa invited us to a night of salsa dancing to raise funds for Intercambio de Comunidades, a non-profit whose goal is to increase opportunities and independence for Latino immigrants. 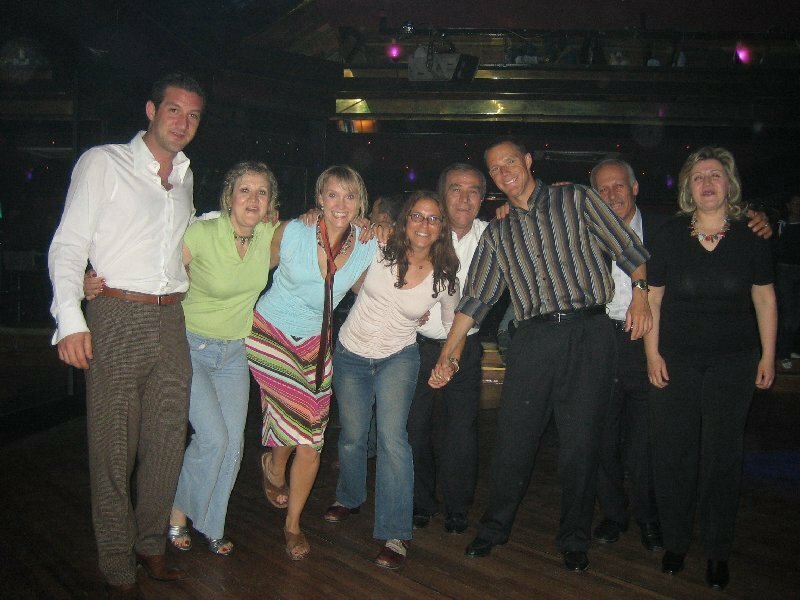 The evening of salsa dancing evoked memories of our last stop in Ankara, when we salsa danced at the Ankara Hilton (at right). As we approach Thanksgiving next week and give thanks for what the year has brought (and yes, enjoy the other turkey, the poultry), I'm most thankful to the kind people of Turkey and to my teammates for an experience that has forever changed me. Tesekkurlar! The History Channel's series "The Crusades: Crescent & the Cross" begins this week. 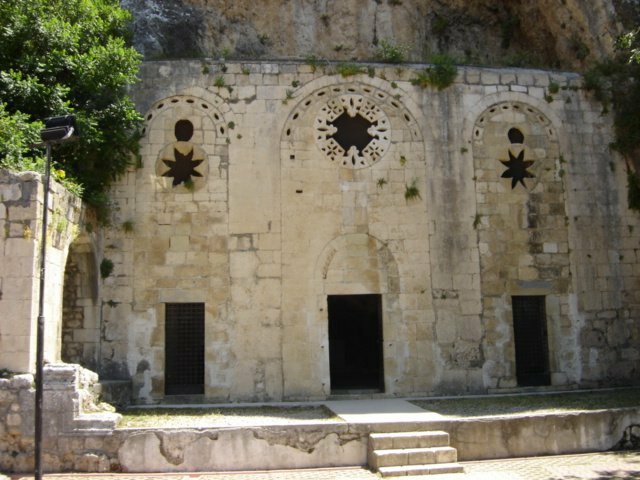 The first episode features Antioch, and includes video of the church we saw in Antakya, overlooking the city. Turkish (and Greek) market in Denver! At any rate, the Turk kahve was depleted, and it was time to restock. My co-worker Igor advised me to check out the shops on Parker Road, across from the Colorado Muslim Center. So this afternoon I visited the Nazar International Market, featuring fine international groceries and Halal meat. It's on the east side of Parker Road, between Jewell and Florida. As soon as I saw the blue "evil eye" adorning the store's sign, I knew I was in the right place. Afiyet olsun! Cok iyi! The store's owners, a Turkish man named Erkan and a Greek woman named Suzan, helped me find all the goodies I loved in Turkey. 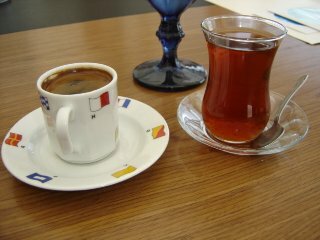 I went home tonight with Mehmet Efendi Turk kahve, Bahcivan taze kasar (white cheese like the Urfa cheese I had for breakfast in Turkey), and Yoruk brand sucuk, the delicious beef sausage. The store doesn't currently have raki, but Erkan assured me they can get more. Will I be going back? Evet! This esteemed group, as varied as Turkey itself, includes two dentists, two English teachers, a speech pathologist, several engineers, and a urologist. From them I learned of the unity of a community recovering from an earthquake, I gained insight into the traditions of Islam, and I experienced the closeness of Turkish family life. I also grew to appreciate the passion of Turkish football (Galatasaray and Fenerbahce alike) and I also learned to love Turk sanat musik and Turkish pop music. When my luggage was lost en route from Istanbul to Ankara, Bahadir talked to the good people of Turkish Airlines (Turk Hava Yollari) and sat with me in the Ankara airport. We drank Nescafe while waiting for my bag. When it arrived, Bahadir drove me to his home, where his mom Mukaddes treated us to tea and snacks, displaying the Turkish hospitality I'd become familiar with during my three-night stay with the Tanriluku family and over the next month in Turkey. After riding in Rotarians' cars from Ankara, we met the Adapazari hosts roadside and were shuffled to Sakarya University, where we were treated to lunch and a university tour. This is a proud, tightly knit community which came together after a devastating earthquake in 1999. They made sure we saw Istanbul, even though (as it's outside Rotary district 2430) the legendary city was not part of our original tour. I stayed for two nights with Taylan and Nermin Onucak and their son Ata - and of course, their dog Gizmo, a little dog the size of Jesse's head. Taylan and Ata showed me one of their houses, which was ruined in the quake. Ata and I discussed music and basketball, and our Adapazari hosts took us to meet two mayors of Adapazari and the governor of Sakarya - right in the middle of a barbecue! After a three-day stay at the Dedeman Hotel in Nevsehir (Cappadocia region), we rode an overnight bus to Iskenderun, where for two nights I was the guest of Meryem Ciftci and Suat Nart. 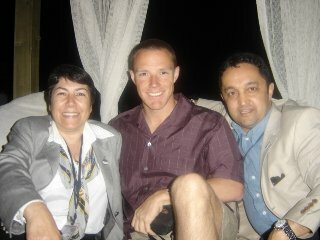 Meryem had participated in a GSE exchange to Australia in 2003. 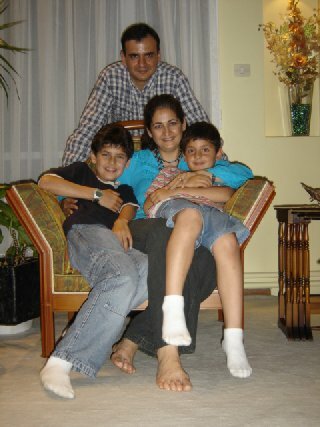 A former English teacher, Meryem now works in her father's export business. Suat is a high school teacher and basketball coach. Suat's sister and a friend were in town from Istanbul, where they are university students. They and I compared growing up and education in Turkey and the U.S.
From Iskenderun, we rode a morning minibus to Antakya, where Firuz Harbiyeli, a urologist who enjoys tennis and windsurfing, tolerated my creative tennis skills on a humid Saturday afternoon. After the Antakya RC meeting that evening, he and wife Duthan took me for a pistachio-topped ice cream cone that's the pride of Antakya. Firuz and Duthan practiced their English during my two-night stay, and my Turkish phrasebook was a constant companion, as I practiced my Turkish. This was where I first became familiar with phrases like "Afiyet olsun! ", "Bir say digil", and "Hosca kilin". The Antakya Rotarians bid us farewell near an ancient river in the city center, and we were off to Mersin, where we met our next hosts at the Hilton. I stayed with Ilhan and Nilufer and their two sons (Kaan and Onur) for five days. 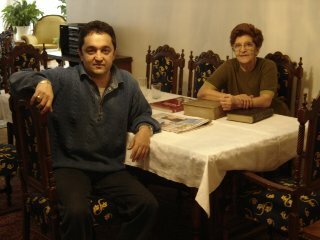 Their dining room became my bedroom, and I spent mornings eating olives, cucumbers, tomatoes, sucuk and eggs in their kitchen, talking with Nilufer and watching Yalin's video for "Gunaydin" on the Turkce television channel. I surprised their housekeeper Ganja when, entering the kitchen, I greeted her with "Gunaydin, nasilsiniz?" Then Nilufer and I would watch as Onur boarded the Okul Tasiti (school bus) in the morning. Kaan and Onur are great kids whose future is bright in science, computers, or even the NBA. Galatasaray Cim Bom Bom and Allah Rahatlik Versin. Those are the two phrases I'll always cherish from my five-night stay with Abdurrahman and his family. We arrived there on a Saturday afternoon, after a riding from Mersin. Deeply faithful, he and Hacer open-mindedly discussed religion with me. 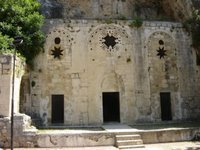 Muslim or Catholic, we're all branches from the same tree, and I appreciate the discussion. I also cherish the 6:00 a.m. run with Abdurrahman as much as the late-night discussions on education with Hacer. This family also taught me to appreciate football. They cheered for Galatasaray, runners-up in the Turkish football championship on May 22, and Abdurrahman and I stayed up to watch Liverpool FC defeat AC Milan on penalty kicks three nights later. After a ride with the Konya Rotarians to Antalya, we spent four nights in Antalya at the District 2430 conference, then rode an Ulusoy bus back to Ankara, our final stop. It was there that Noyan Bakir taught me the ways of Fenerbahce (sorry, Abdurrahman), showed me the rehabilitation he and wife Esma operate, and explained how the ornate marble paintings "Ebru" are made. As the final stop on the trip, it was especially bittersweet saying goodbye to the Bakirs (whose name means "copper"). I can still see Esma waving goodbye from the fourth floor window as Noyan and I drove away to the airport. Er Buyuk Kopek had a vacation too - and is a TV star! 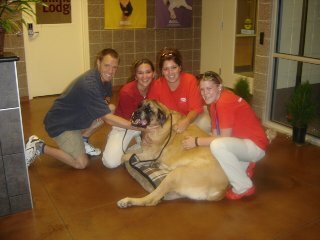 While I was in Turkey, Jesse stayed at the brand new, state-of-the-art Animal Lodge at Alameda East Veterinary Hospital. Though he didn't get to join me in enjoying Turkish food and swimming in the Mediterranean, he feasted on low-residue Iams Senior and swam in AEVH's water therapy pool, an underwater treadmill. This pool allows dogs to exercise their joints at low resistance, while keeping their head above water. It helped Jesse's arthritis. With Jesse and Animal Lodge's Kari, Molly, and Adrianna. They took great care of Jesse while I was in Turkey. He even got on television. On June 1, KWGN's morning news featured the Animal Lodge, which recently celebrated its grand opening. Reporter Dan Daru saw Jesse lumbering along in the water therapy pool and said, "Look at this old paint! He's thinking, 'Get me out of here; this is so humiliating!'" Jesse gazed up at the camera, his lip wedged over his lower tooth in his customary Winston Churchill pose. This prompted KWGN weathercaster Angie Austin to quip to the reporter, "Dan, I think that dog needs a dentist! Look at that tooth!" KWGN anchor Tom Green also asked the reporter, "Dan, is that a dog or a cow?" All my bags are packed and I'm ready to go. I'm leaving on a jet plane, I don't know when I'll be back again. It's all over except the flying. 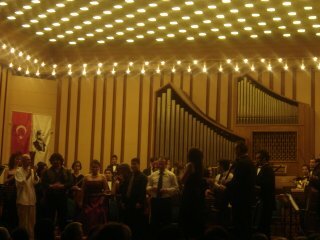 With our hosts, Jan, Lisa, Bethany, Steve and I attended a terrific symphony performance Wednesday night at Baskent University, including Nabucco, the Madame Butterfly Overture, Gilgamesh, and a Sicilian Folk performance. Bethany left the show early to catch a bus en route to her departure point for the Greek Islands. Lisa left immediately afterwards to catch her bus for Istanbul. Noyan and Esma drove me home, where we ate cookies, drank coffee, and chatted. Then it was time to pack, a bittersweet task which is now done and I'm writing my final posting from Turkey. In 6 hours I will board a plane headed west. Words cannot describe what an incredible month this has been. Thanks to all my hosts in district 2430: Bahadir Tanriluku (Ankara Emek), Taylan and Nermin (Adapazari), the Dedeman Hotel (Cappadocia), Meryem Ciftci and Suat Nart (Iskenderun Yarikkaya), Firuz and Duthan Harbiyeli (Antakya), Ilhan and Nilufer Karaselcuk (Mersin), Abdurrahman and Hacer Ozkaynak (Konya), and Noyan and Esma Bakir (Ankara Kocatepe) for inviting me into your homes and welcoming me as a temporary member of your family. I will never forget any of you. Thanks to district 5430 for sponsoring me and thanks to my teammates Lisa, Steve, Bethany and Jan for all the laughs and camaraderie - for example, all the inside jokes. Cok tesekkur ederim, Turkiye! Seni Seviyorum!